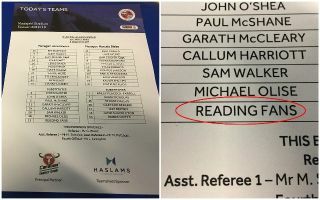 Championship side Reading conjured up a bizarre way to motivate their fans and team ahead of their clash against Leeds last night, take a look below. The Championship strugglers decided to name their own fans as substitutes on the team-sheet for yesterday’s tie, Leeds reporter Phil Hay noticed the Royals’ surprise 13th man and took to Twitter to share the bizarre finding. Reading had lost just once in their last six league games heading into the meeting against Leeds, the one-time relegation candidates now look as though they’ll avoid the drop this season, the turnaround is quite phenomenal. It turns out that naming the fans on the bench just wasn’t enough to inspire a decent performance against Leeds, and it turned out that Reading’s so called ’13th man’ was fairly quiet in their 3-0 defeat to Marcelo Bielsa’s side. Leeds are now back at the top of the Championship table.